The UK has thousands of people who rely on the use of a minibus every day, travelling to corporate events, school trips and music festivals is often taken for granted such is the commonness of minibus use. 15 seat minibus hire is arguably the most popular of all bus sizes and is stocked by most rental companies. Rental firms specialising in car, van and truck hire also tend to have a 15 seater amongst their fleet, such is the demand for this type of minibus. One thing that adds to the popularity of 15 seat minibus hire is the fact that no special diving classification is required to operate the vehicle. Anyone with a standard car licence is eligible to drive a 15 seater (on a not for profit basis) making one of the most popular hire vehicles of all. The 15 seat minibus offers luxury surrounds and ample space for each passenger, it is a world away from the cramped up atmosphere that is had with a group of 15 trying to squeeze into multiple taxis. Being a larger vehicle means leg and head room is afforded to each passenger and each member of group has an individual seating space complete with arm rest and seatbelt. The 15 seater also has benefits over smaller vehicles in the amount of luggage that can be stored. Smaller buses such as 9 and 12 seaters are not designed to carry both passengers and luggage meaning a group must pack light; a 15 seater has both spaces at the back of the vehicle, and on some models, room for overhead luggage. Most of the modern 15 seaters such as the Ford Transit are equipped with air conditioning and a CD player as standard so that passengers can travel in comfort and be entertained at the same time. Luxury models may enhance features by including a TV and DVD player with surround sound, and iPod docking station, reclining seats and a minibar. A toilet may also be included on some of the high end models. 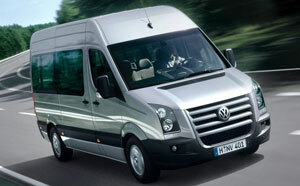 Of all the different sized minibuses on the market, the 15 seater is the popular. It is the perfect size bus and provided excellent space normally associated with coaches whilst retaining the manoeuvrability of a smaller vehicle. Finding a 15 seater should not be too much of a problem as they are the pride of many a rental firm fleet. The amount of 15 seaters on the market can only be good news for the consumer as rental companies are in constant battle to outdo each other and provide the best priced hire along with the best customer service. A guaranteed place to find 15 seat minibus hire is at one of the UK’s many airports. Airports are the home turf for many of the leading hire companies as they look to compete for the customer of incoming visitors to countries. Many are able to match or beat your lowest quote in order to gain custom; meaning cheap minibus hire is guaranteed.